Wild carrot is an umbelliferous plant naturally occurring in meadows and other undisturbed places throughout most of the world. It is a member of the carrot family that earned its name because its taproot smells just like the garden variety of carrot. 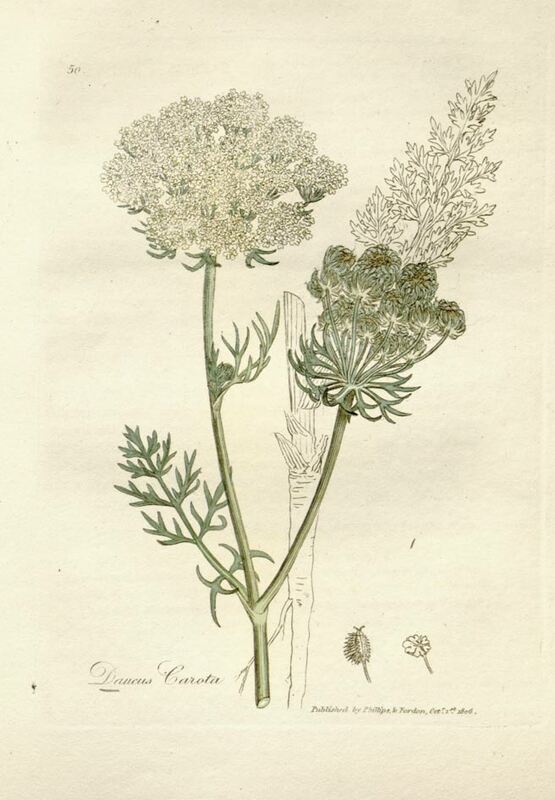 Also known as Bishop’s Lace, Bird’s Nest and, most commonly, as Queen Anne’s Lace, wild carrot was cultivated as a vegetable by the ancient Romans as well as by early American colonists, who also used the herb to flavor wine. With the exception of sugar beet, wild carrot root contains more sugar than any other vegetable. The leaves, seeds and delicate lacey flowers are traditionally used in teas or as seasoning for soups and stews. Daucus carota is a flowering plant in the family Apiaceae. Wild carrot as it is commonly called is a biennial plant. It will grow a rosette of leaves in the spring and summer, while also building up the stout taproot that stores the large amounts of sugars that will allow the plant to flower in its second year. The first or primary umbel is produced at the end of the main floral stem; while smaller secondary umbels sprout from the main branch, and then will branch into third, fourth, and even later-flowering umbels. The large primary umbel can contain up to 50 umbellets. Each of these umbellets may have up to 50 flowers; however the subsequent umbels will have fewer flowers. Flowers are small and white in color, on occasion they will have a light green or yellow tint. They have five petals, five stamens, and an entire calyx. The fruit that the plant develops is a schizocarp consisting of two mericarps; each mericarp is an achene or true seed. Domesticated carrots familiar to gardens everywhere are cultivars of a subspecies, Daucus carota subsp. sativus. The multitude of tiny white flowers together appear lace-like and have given rise to the common name Queen Anne’s Lace. Wild carrot grows on cultivated and waste land, amongst grass, especially by the sea, and in sunny meadows. Prefers a well-drained neutral to alkaline soil. Sow seeds in August/September or April directly in the garden soil. The seed germinates better if it is given a period of cold stratification. 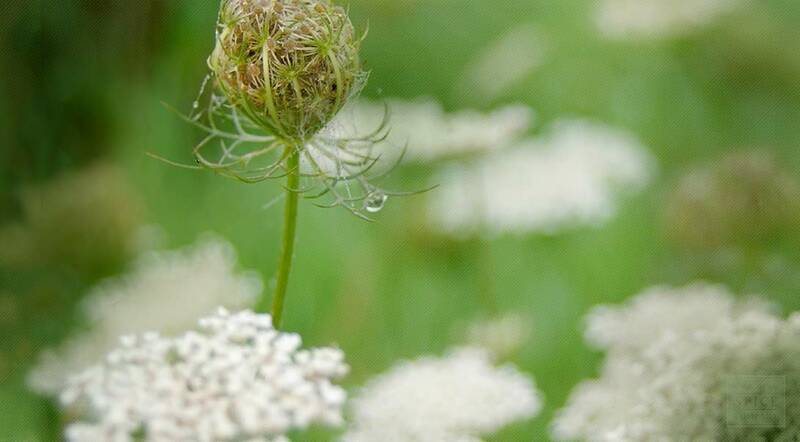 Thewild carrot plant is harvested in July when the flowers bloom and is dried for later use. Roots and shoots can be harvested in spring when still tender. Store dried wild carrot herb in an airtight container in a cool, dry place.